Update 2/11/09: This car just showed up on Anamera advertising that it will be auctioned by RM. They are looking for $125,000. How much mark up does a detailing add? Someone is going to find out! This is one sweet ride. Knowing me, if it were mine I’d commute in it. 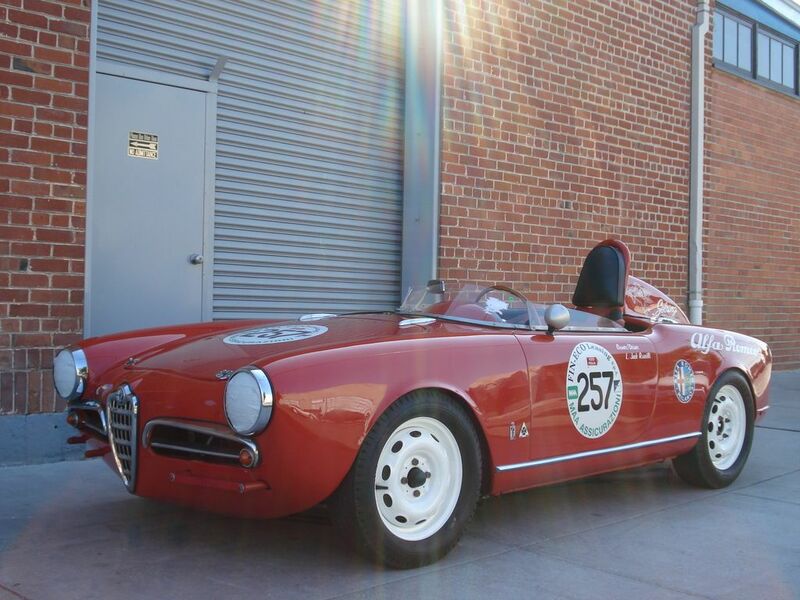 Ex-Al Leake 1957 Giulietta Spider ‘Monoposto’ 1495*02646, Engine 00106*00512. This is a pretty serious purpose-built race car and it is available right now from Fantasy Junction. Click on the link if for no other reason than to look at the 50 or so pictures provided. No price is stated but Sophia, his most often raced Giulietta Spider made about $75,000 on eBay last winter so you can bet that this car will be at least that much. Al Leake along with some other guys including H.B. Luginbuhl had an SCCA race team that started in the late 60’s/early 70’s called Rubber Chicken racing. Al continued to race and build Alfa’s for many years until he lost a battle with cancer earlier this year. A little of his history and cars can be read here on the Alfa BB. I saw Al race a few times at Sears Point and Laguna Seca and I can personally attest that he was very very fast and that this car is capable of winning against seemingly faster and more nimble cars if well driven. It’s refreshing to see a modern era vintage race car that is both fiercely competitive and tastefully presented. I like the contrasting white wheels and cut down windscreen. A lot of Giulietta Spider race cars lose the under door trims, eyebrow trims and even grill heart. If you are fast this eight pounds of jewelry isn’t going to keep you from winning. Subscribe to Alfa Romeo Giuliettas by Email. It's free! All writing included in Giuliettas is copyright Matt Hamilton unless otherwise noted. You may quote me of course, but please give credit where it is due. Under U.S. Copyright law, Section 107, entitled 'Fair Use', copyrighted material may be used for educational purposes; all materials on Giuliettas are for educational purposes only. Want to show your Italian car March 31 in the Bay Area?